Gathering customer feedback seems like a no-brainer now. Every company does it to a lesser or greater extent. Businesses spend thousands on setting up various customer feedback channels: surveys, emails, reviews, rates. Is it worth it? It definitely is if you know how to act on the customer feedback you get. Customer feedback can be truly eye-opening. It sometimes will completely change the way you think about a particular product or feature. We had a moment of realization like this recently when updating some of the features for our Enterprise users. Read on to see how it went down, how we gathered and then used customer feedback and how it completely changed the way we see a part of our product. 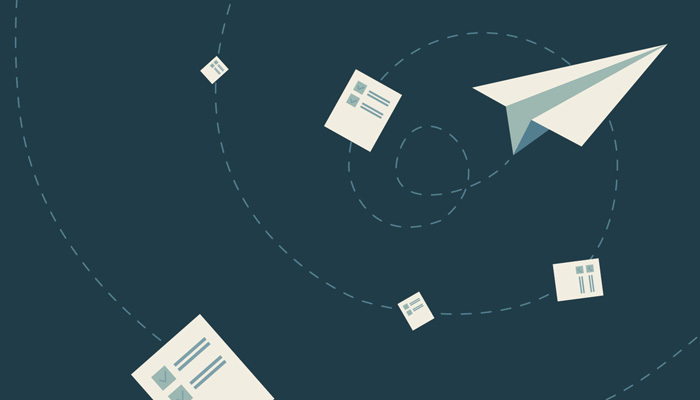 First off, there’s a ton of avenues you can choose from when collecting customer feedback. You can go for the direct approach and ask customers directly or see how they use your products to get indirect customer feedback. Customer surveys – Short forms you can place on your website, offer through email or chat. They include a mix of open questions (What would you like to see improved in our product?) and questions with predefined answers (Rate the service on scale from 1 to 5). User testing – An indirect way of gathering feedback is checking the way your customers use your products. For example, a software company might want to see how users react to certain features after they are released. For example, how many users accessed them or how many turned on the features. Approaching customers via phone and email – You can directly ask customers for feedback via phone and email. This can be either a follow up after previous contact or an independent attempt at asking the customer for opinion on your product or service. This option opens up the possibility for personalization but also requires the most effort. 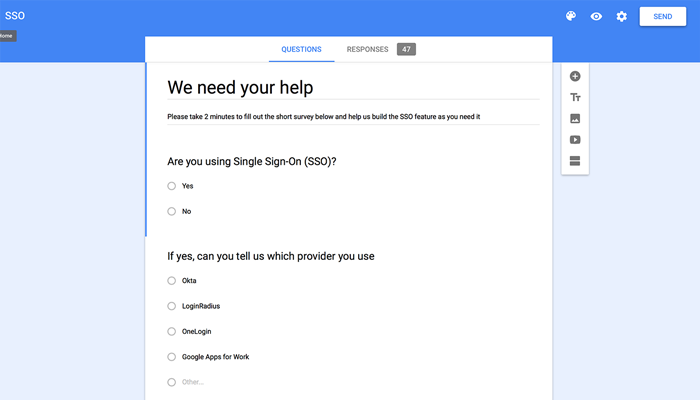 In our case, we decided to improve one of our Enterprise plan features – the SSO (Single sign-on) login. We already had a simple version of the feature in place by providing a log in with Google Account option. We wanted to build upon that and create a Google Apps for Work SSO integration. Additionally, we wanted to find out what other SSO providers are used by enterprise companies. We created a very basic survey to check which providers we should include. Creating a survey is one of the most popular means of getting customer feedback. And that is no surprise as it requires very little effort. It can offer some good insight into your customers’ view of your product or service. 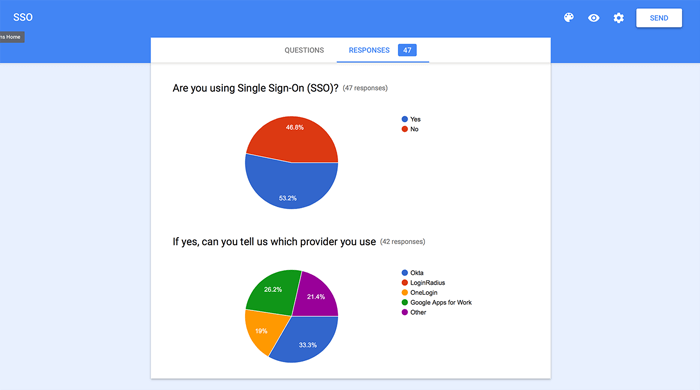 You can set up a basic survey in Google Forms in a minute or two and start offering it to customers. If you’re using LiveChat, you can also offer a quick survey at the end of each chat. You can ask if the customer is satisfied with the received service or if they have any comments. The survey results will sometimes point to problems or options you would never explore yourself. In our case, we strongly favored one of the SSO providers (Google Apps for Work). We simply thought it was most popular and the best overall pick. The survey results showed us that our first pick was not the most popular with our customers. They were more interested in another provider called Okta. The third provider called OneLogin was also a better choice as it required almost no new development. Google Apps for Work relied on a different protocol (SAML 2.0) and would require more development. As a result of this, we decided to go against our initial idea and we started building integrations with the other two SSO providers. Once we started offering new SSO providers (as beta access), we thought that it was smooth sailing from that point on. To check if everything is going according to plan, we consulted our monitoring systems. Monitoring user activity on your website or in your service is the most honest form of feedback you will get. You will know exactly how someone uses your website or service. Everything will go on record. There are many services that allow you to do this. You can measure how visitors are accessing your website through Google Analytics. To do that, you need to identify potential customer pain points. For example, if you notice that visitors spend a lot of time on a particular page and leave, there’s a good chance there’s a paint point on that page. In our case, we measured how many companies activated the new SSO feature using Amplitude. It’s a service that allows you to track pretty much everything that happens on your website or in your software. To our surprise, hardly anyone used the new SSO feature since its release. Instead of scratching our heads and trying to guess why nobody was using it, we decided to ask directly for customer feedback. We did that by following up with an email. Writing a quick email or calling your customers is another way of gathering feedback. This method is a bit more precise but also requires more effort. It’s much harder to analyze the feedback you get this way. Different customers can point to and comment on completely different aspects of your product. The amount of feedback you get this way will be also much smaller. You will be able to call only so many users. When it comes to email, you can create a campaign that will reach thousands but you will still need to process the replies manually. Should you use this kind of customer feedback method then? You definitely should and here’s why. Despite its drawbacks, a follow up like that can be a powerful tool. It will not only give you access ti customer feedback but will also show your customers that you care and appreciate their opinions. Creating a bond like this will be much more valuable in the long run than the actual customer feedback. We decided to send a quick follow up email to all the users who should be using the new SSO login feature but, for some reason, weren’t. As it turned out, it was such a big step that customers didn’t want to take it lightly. Changing the way all agents log in to LiveChat is a pretty big deal and can take some time, especially in bigger companies. As a result of the follow up email, we got a ton of positive customer feedback. Even though few companies were using the feature yet, a lot of customers let us know that they already asked their IT department to implement it. As you can see from our story, we didn’t simply stop at gathering feedback from our customers. It’s a good first step but it’s useless if it’s not followed up by action. In our case, this meant going against our gut and picking the SSO providers our users really wanted. A simple survey saved us (and can save you) a ton of resources and time when there were several avenues to choose from. When we implemented the updated SSO feature, we wanted make sure it works for our users and acted when we saw that few companies went for it. A bit of monitoring tech allowed us to check how it was performing and if customers were using it. You can use the same tech to track the way users are acting on your website. Thanks to another round of customer feedback, we learned that companies were simply taking their time with implementing the feature. It was no small step for them. Once again, a bit of customer feedback gathered via a follow-up email saved us from coming to the wrong conclusions. An email or a call follow up will also show your customers that you care about their opinions. What’s the key takeaway from all this? Make sure your attempts at gathering feedback don’t feel automatic. Making it personal will allow you to kill two bird with one stone. You will get the crucial piece of feedback and create a lasting relationship with your customers. What other means of gathering feedback do you use? Do you have any examples of feedback that completely changed your approach to a problem? Any interesting customer feedback stories? Feel free to share in the comments!